International Fair "TEHNOMA" 2014 covers areas: black and ferrous metallurgy, metal processing industry, electrical and electronic industry, energy, building and isolation materials, tools and equipment for civil engineering, technical and technological innovations, equipment and technologies for exploiting solar and renewable systems and other sources of energy and systems for fire alarm. It is organized annually since 1974. - The Agro Machinery Exhibition. The fair "TEHNOMA 2014" (14.10 - 18.10. 2014) is on an area 12,000 square meters and includes 150 companies from Macedonia, Serbia, Hungary, Bulgaria, Greece, Turkey, Croatia, Albania, Austria, Bosnia and Herzegovina, Slovenia, Italy and Kosovo. 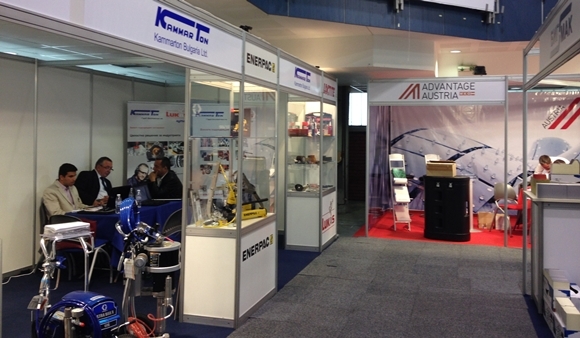 "Kammarton Bulgaria" is single participant from Bulgaria with a stand in Hall 1 of "TEHNOMA 2014" and presents some of the highlights and innovations in the products of our business partners – hydraulic tools ENERPAC (the representative and the authorized service for Bulgaria and Macedonia), pumps Grindex, paint systems Graco, Loctite, LUKAS-ERZETT and others. There will be many presentations organized by the exhibitors. The exhibition is open to visitors from 14 to 18 October 2014 from 9.00 to 19.00 h.
More photos - here. and facebook.